The 1st World Scout Jamboree was held from July 30, 1920 to August 8, 1920 and was hosted by the United Kingdom at Kensington Olympia in London. 8,000 Scouts from 34 nations attended the event, which was hosted in a glass-roofed building covering an area of 6 acres (24,000 m2). It was at this event that Baden-Powell, the founder of Scouting, was acclaimed the Chief Scout of the World. The Olympia arena was filled with a foot-(30 cm)-deep layer of earth, which was turfed over, enabling the Scouts to pitch tents within the glass-roofed hall. However, around 5,000 of the Scouts were encamped at the Old Deer Park in nearby Richmond. 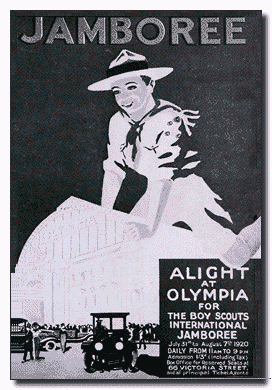 The Scouts rotated in and out of Olympia to give them all the opportunity to participate in the events there. The Thames flooded the campsite one night and Scouts had to be evacuated. Olympia hosted numerous exhibitions, pageants and contests during the Jamboree event. 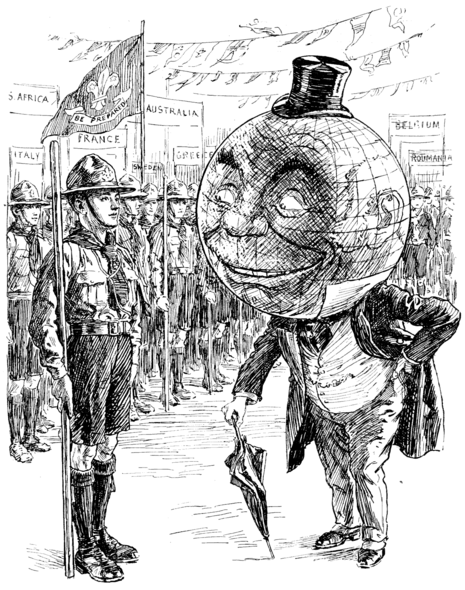 An enormous feat of organization, the first Jamboree was held from July 30, to August 8, 1920. B.P. himself played the key role as General Commissioner. The Organizing Secretary was A. G. Wade, a former Secretary of the Association back from the war with the rank of Commander. A first-class man, Wade stayed with Scouting for life. His wife Eileen also caught the Scouting bug and was private secretary to B.P. for 27 years. Some 8,000 Scouts turned up from 21 independent countries and 12 British dependencies. About 5,000 camped, the rest lodging in makeshift boarding houses or at the vast Olympia Hall in London where the Jamboree took place. The festivities lasted for eight days.